Sigmon and Sadako Whitener drove in the dark from Sarasota to ILE on Friday morning to partake of the baby cranes. They were glad that they did. “The pleasure was ours! It was great fun.” We did well with the two rapidly growing colts and great with the smaller chicks. They also enjoyed photographing the tame adult cranes. As both were fairly experienced photographers who traveled a lot we worked a lot on changing perspective to improve the background. Sadako was also glad that I helped her with holding her Nikon 80-400VR. As many do, she had developed the bad habit of placing her left hand too close to the camera. Now she is holding it halfway out on the lens barrel for far greater stability. Sig and Sadako are from Los Osos, CA. Yikes. I almost forgot, both had their eyes open as I pounded on sun angle, sun angle, sun angle all morning long. They got it! After a week of swimming a mile each day I took a rest on Friday by cutting back to 44 lengths, a half mile. Today I will be doing the long swim again and am planning on at least 88 lengths every day from now until I leave for TX. On that note, I was glad to learn the IPT veteran Warren Robb and his non-photographer spouse Kathy will be joining me at Roma. I still have room for one or two more photographers. See the previous blog post for details. Multiple IPT veteran Morris Herstein sold a Canon 600mm f/4 L IS II USM lens in like-new condition for the incredible BAA record-low price of $6,999.00 (was $7,999.00) in mid-March. 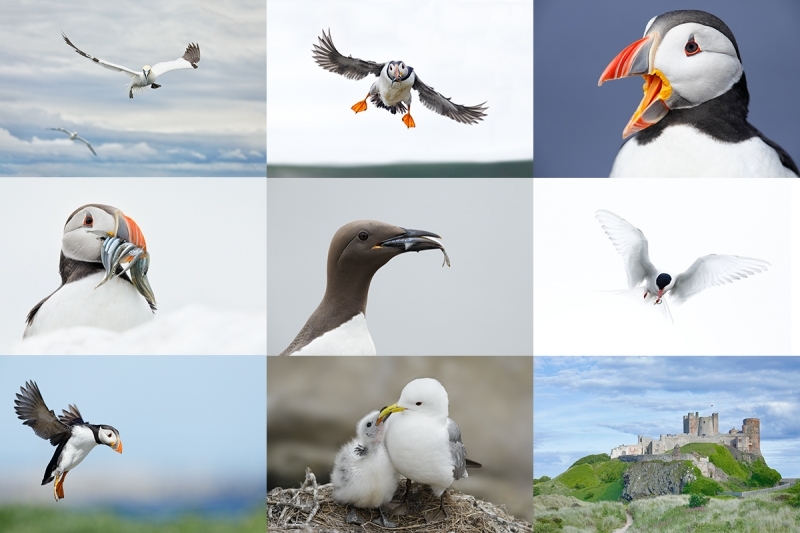 Todd Koudelka sold a Canon EF 500 mm f/4L IS II USM lens in excellent to near-mint condition for the BIRDS AS ART record-low price of $6299.00 (was $6499.00) in late March. Gary Meyer is offering a used Nikon AF-S NIKKOR 200-500mm f/5.6E ED VR Lens in mint condition for the BAA record-low price of $909.00. The lens is a year old and the glass is perfect. The sale includes the original box, the lens hood, the soft case that came with the lens, the front cover, the rear lens cap, and insured shipping via Fed Ex Ground. Your item will not ship until your check clears unless other arrangements are made. Please contact Gary via e-mail of by cell phone or text at 1-612-221-0150 (Central time zone). This image was created in Northern Manitoba Canada by multiple IPT veteran Anita North. She used the Induro GIT 304L/Mongoose M3.6-mounted Nikon AF-S NIKKOR 600mm f/4G ED VR AF lens and the mega mega-pixel Nikon D850 DSLR.. The additional EXIF data is unavailable. 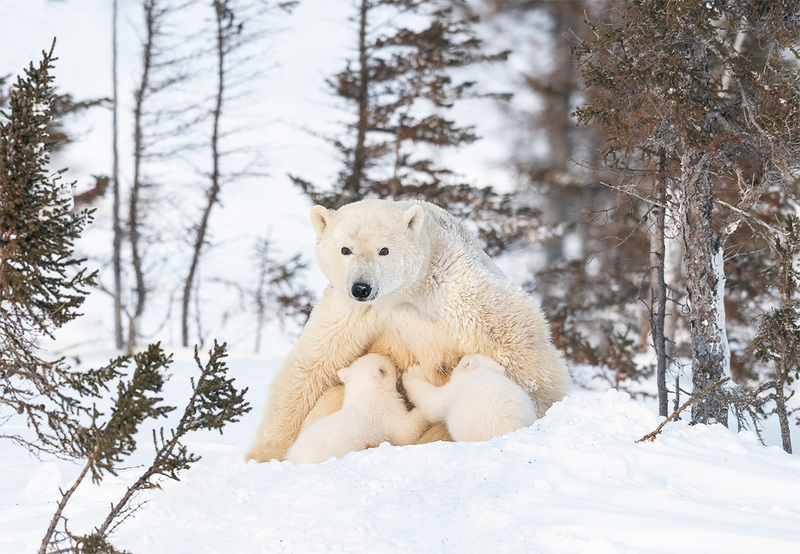 Many multiple IPT veteran Anita North visited northern Manitoba, Canada a month ago to sit or stand in the snow for ten hours a day waiting for baby polar bears to emerge from their dens with their moms. When she returned, she told me that she was disappointed and felt that she had not created any outstanding images … Then she sent me an e-mail with seven images. Six of them are presented here today. The Warmest Day of Twelve in Northern Manitoba, Canada Was -35 Degrees Fahrenheit! Anita did an excellent job of choosing her perspective to create Image #3. Why would the image have been slightly better had she moved six to 12 inches to her left (even though that would have left her fractionally more off sun angle? 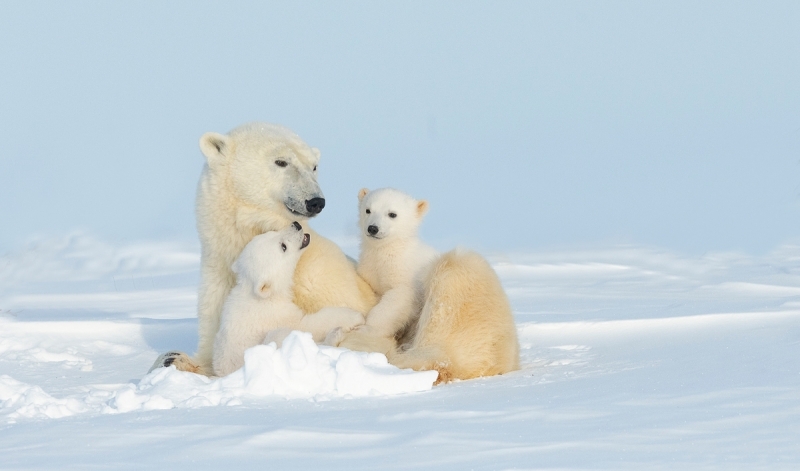 Have you ever before seen a photograph of a Polar Bear with all four paws off the ground? 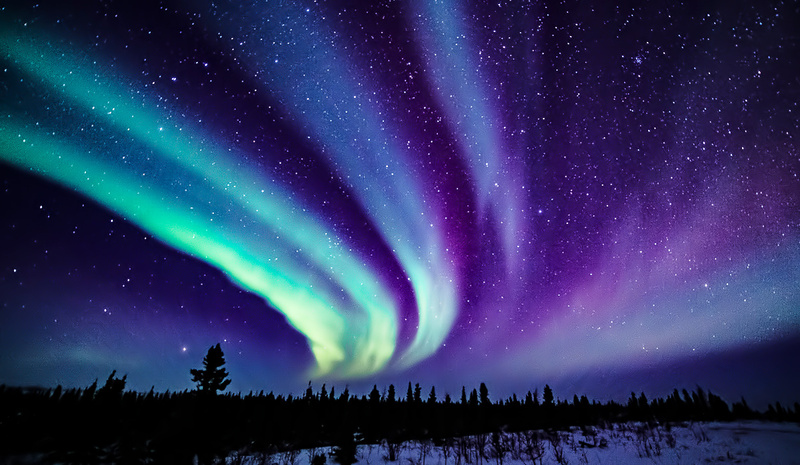 This image was created in Northern Manitoba Canada by multiple IPT veteran Anita North. She used Induro GIT 304L-mounted Nikon AF-S NIKKOR 14-24mm f/2.8G ED lens and the mega mega-pixel Nikon D850 DSLR.. The additional EXIF data is unavailable. I saw the Northern Lights once in Denali. I had no clue as to how to photograph and I was too cold to have tried even if I did. Nothing has changed. I used NeatImage to clean up the noise in the jpeg that Anita sent. 24 comments to Anita North Does It Again: The Warmest Day of Twelve in Northern Manitoba, Canada Was -35 Degrees Fahrenheit! p.s. I like 2 the best, simple and clean! I like all images. Nothing to be disappointed about. I like image 2 most. These are all excellent images. I’d be thrilled with them if I were her. #6 is my favourite. Love the snowshoe hare and #3 also. Kudos to Anita for her perseverance. Standing around for that long in the bitter cold ain’t easy… or fun. Yes, I do believe a few branches have disappeared in image 6. What a great image. I liked the branches in #3, but the were too close on the left. I think I would have preferred moving the branches rather than deleting. But the look of the left cub in #6 is great! You guys have good eyes. I though that #3 and #6 were two different situations … If Anita ever shows up we can ask her. If she did remove the branches she did a great job. with love and see you in Roma, TX soon! I’m sure Anita could teach me a thing or two. The pictures you’ve posted of hers are great. I like 1,3,5,6 the most and the twigs don’t bother me but moving to her left a little bit would have moved the twig on the left side further away from mom’s head. 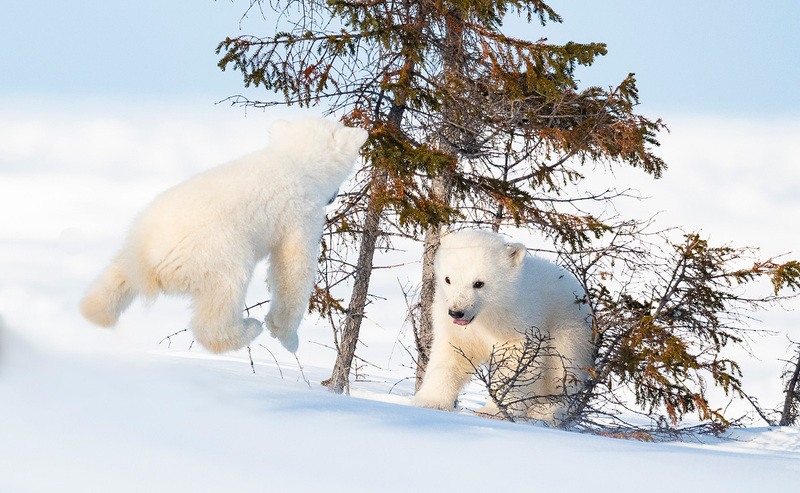 I do like the cub shot with all 4 paws airborne, makes it fun and playful. Great stuff… Thanks for sharing. Image #6 is my Favourite, and #3 a close second! Arthur, I swim for health also. Just 4 days a week. 2400 yards the first day, 1800 yards each day the next three days. 889 laps is a lot of laps, I think you should cut that down some, like maybe 88. Then you will have time for photography. I would be very happy if I took Anita’s photographs Image #4. I think I like the simplicity of the hare, then #6. The expression of Mom on #3 is best, but closeness of the branches on the left of the image detract just a bit (move the camera 12″ to the left??) for my tastes, but otherwise a fine image. #4 with 4 feet off the ground is really nice, as well. I would be happy to claim any of them as mine. Anita’s standards must be off the charts if these in any way disappoint her. I think they are great, and given the conditions you make them under, I’d say fully successful. Bravo. Hi, Artie and Anita. 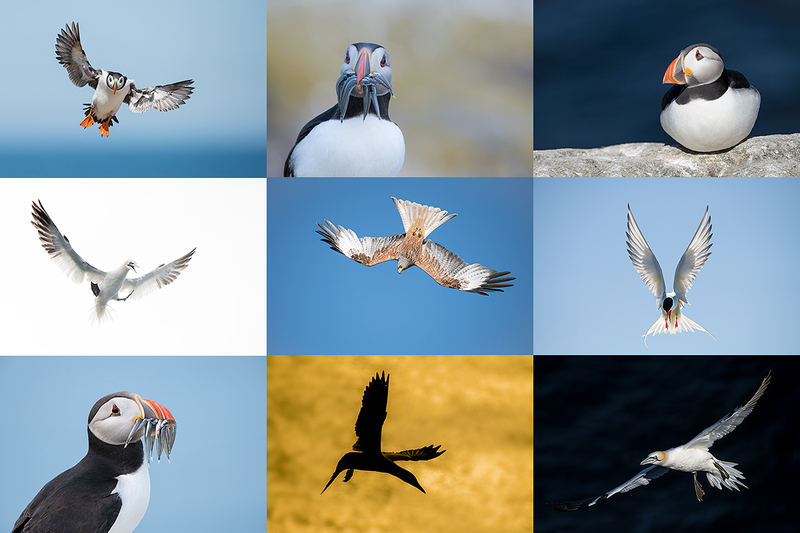 Those are 6 outstanding images. If Anita is disappointed–a friend of mine always says disappointment is a choice!–I’d love to see the images she was imagining. These are great. I think my favorite is Image #1. In answer to your question about image 3, if Anita had moved slightly to her left, the polar bears would have been better framed by the vegetation (Between Two Ferns). I also love the aurora image. You need to use a wide-angle lens, as Anita did. Beautiful photos Anita! Hard to decide on a favorite: in image #1 I like the mother bear looking straight into the camera; I like the hare photo too; image #3 is dynamic, tender and playful; image #4 – no Artie, i’ve never seen a photo of a polar bear cub with all four paws off the ground – this must be quite a unique capture! ; Northern Lights photo – love the design and colors. In the end, I choose image #3 over image #6. Why? 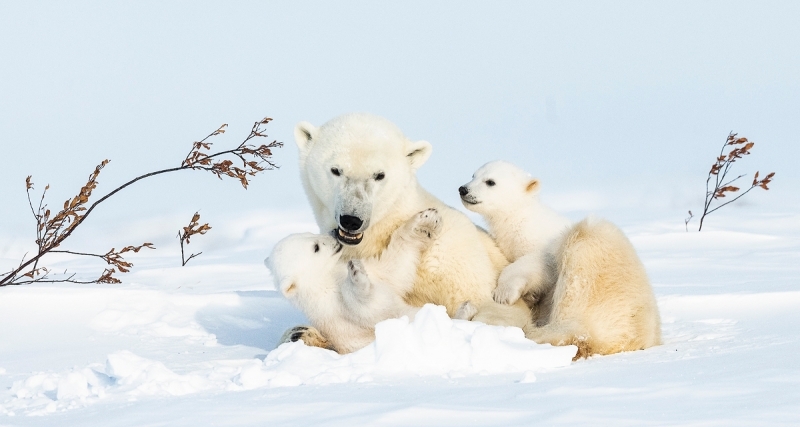 Because the mother bear is more engaged with the cubs in a playful way in image #3. In image #6 she doesn’t look playful to me – just tolerant! 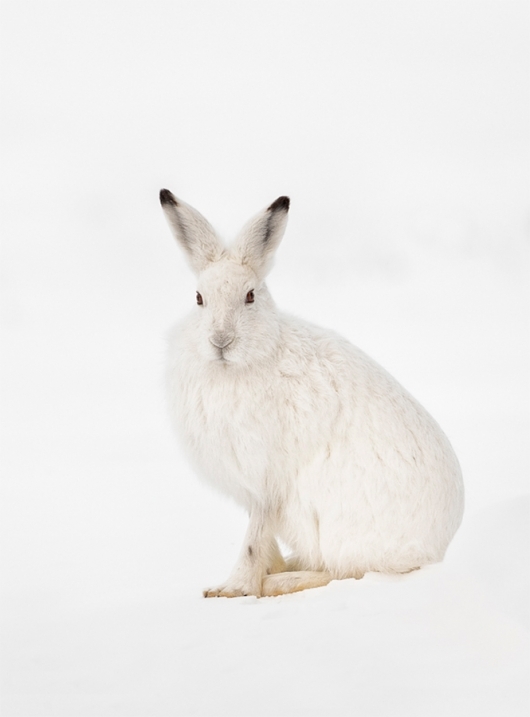 #2, Arctic Hare, should be a fine art print hanging on a wall. #3 is my favorite if the branch near mom’s head could be moved to the left 8 inches in photoshop. Not removed, just moved left a little. Hi Artie and Anita, my very clear favourite is image #3. I love the positions of the bears and the twigs on either side, as well as the colour separation between the bears and the slightly blue sky. In response to your question, the image would have been marginally better had Anita moved 12 inches to her left because the bears would have been more evenly framed by the twigs on either side i.e. exactly in the centre of the gap. Tell Anita “great stuff here!” If I had to choose however, I go for #6. The interaction among the family is really nice, and the high-key hare is really nice as well. I think her patience paid off. Overall, I can understand her disappointment in regards of some other photos from that site but they are still very good and exclusive. Thanks for leaving a comment. I cannot understand her disappointment at all as to my eye, these are pretty much as good as anything I have seen from up there … Just my two cents. ps: not sure what you mean by exclusive?